"We know that this world is being prepared for huge appearances. In a short while there will be a common change, physically and then spiritually." "Time is now over. All nations and all mankind are being prepared for something that is approaching soon. These are huge events, unexpected huge events." "I am knowing and you must believe that I have come on the order of the Divine Will. I have come on the command of the Prophet (sal) and of the saints." "I have not come to this place but to make Haq (truth) to be like the bright light of the sun." His Holiness Sheikh Nazim Adil Al-Haqqani, world leader of the Naqshbandhia Order, is respected as a servant of Allah throughout the Islamic world. A native of the island of Cyprus and Turkish by descent, the radiant, blue-eyed Moulana ('wise one') is a striking figure in mullah's robes and white turban crowned with the green pointed kulah cap of Naqshbandhi sheikh (literally, 'old man'). In Damascus he met Grand Sheikh Abdullah Daghistani, the thirty-ninth sheikh in the Golden Chain beginning from the Prophet Muhammad. 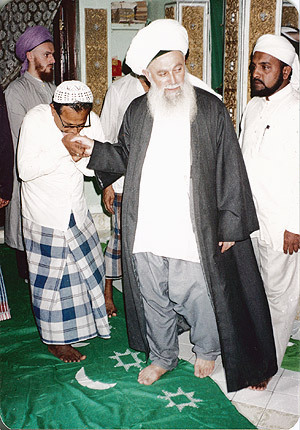 For twenty-two years, Sheikh Nazim performed haj annually. Finally, his Grand Sheikh told him to "Take Islam to Europe." From England and Germany his following has expanded to Asian countries including, for the last five years, Sri Lanka. With Sheikh Nazim's kind permission, I record here just a few of his remarkable utterances that spring from a heart immersed in the Holy Quran and the life of the Holy Prophet (Sal). Expressed in simple English, they deliver a message to all that even greater changes may be expected shortly. "I am not a teacher or lecturer," he says with typically self-effacing modesty. "I am only a humble servant of Almighty Allah." "I am now in my seventies, and to be with you. You must believe that I am a knowing person. If a person knows, you don't say that he believes." "I am also one of the people who are expecting a saviour and who is looking in the morning and in the evening to hear his news. That is the only news that I am waiting for." 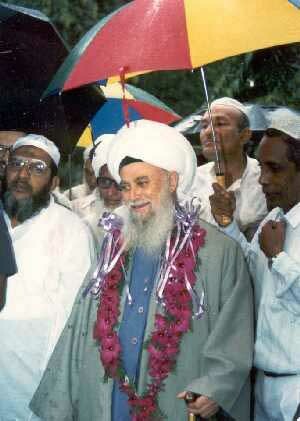 Below: His Holiness Sheikh Nazim Adil al-Haqqani with murids, seen here within Khidr Maqām at Kataragama.
" As believers of the traditions, we believe in a saviour who will come first, before Jesus Christ. We have in our traditions his name, which is Muhammad d'ul Mahdi." "He is coming, but his arrival will be after a great war. It will be the fight of the big powers with each other. And in that war the saviour will come like a divine hand from heavens to the earth and stop the war." " After a short time a tyrant will appear, well-known through traditions as the Anti-Christ. When Jesus Christ was on earth he never touched a sword, but now he is coming as a saviour. In his time all technology will be finished." "His sword can reach any point to where He sends it. It is a miraculous sword, a heavenly sword. His Lord gave it to Him. He will save the people from the hands of the Anti-Christ." "We are getting closer to al-Qiyamah, the Day of Resurrection. 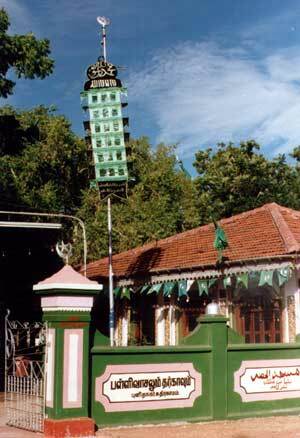 There will be a day when the people are going to be in the Divine Presence of Allah Almighty. He has informed us of these very signs passing before our eyes and fast approaching. Archangel Gabriel shall blow his horn. "For all the people he will appear in the Great War. The Great War will break out between East and West. These will be very difficult days for mankind. There will be very strong fighting. Very many people will be killed." "Then the Lord will command al-Mahdi Alaihi as-Salam to appear. Now he is in a cave, in a big, deep cave. No one can approach it. Jinns (genies) are protecting and guarding him." "Mahdi Alaihi as-Salam and his ninety-nine Caliphs are there (in the Empty Quarter of Arabia). They are waiting and expecting the Holy command of Allah Almighty to appear. And his appearance should be soon, Inshallah." "When he comes, he will say, Allahu Akbar, Allahu Akbar, Allahu Akbar (Allah is the Greatest) and this will be heard from East to West without a doubt." Speaking at Cinnamon Gardens after Jummah prayers recently, Sheikh Nazim said he was "very happy to be in Serendib as a pillar of understanding and peace for everyone." He warned, however, that the spirit of Shaitan was alive and working herein Sri Lanka in recent years and that it was the duty of good people when they saw the mischief-makers to catch them. Justice and faith, he said would give them the strength to do this. "In our times the devils are establishing their kingdom on this planet -from East to West and from North to South, We (mankind) are supporters of their kingdom, We are supporters, strong supporters. Soon huge events will come on earth because we are supporting Satan and his kingdom,"
"Therefore the saviours, Mahdi and Jesus Christ must come. And they will destroy the kingdom of devils on earth,"
"There is only one Commander in the entire universe and everyone must follow His Commands. No one can command Him. He commands all. The angels are also absolutely under the Divine Command." "Our nafs (ego) forces us to obey it, not to obey Allah Almighty or anyone else. In order to overcome this, we have been ordered to fight the ego. That is the Jihad-ul Akbar, the greatest holy war." "The ego always wants to do the opposite of what Allah Almighty orders, just the opposite thing. Therefore there can be no agreement with the nafs because the nafs is against its Creator and against all prophets. Its friendship is with Shaitan only,"
"You Muslims must keep yourself far away from fitna (strife and commotion). You must be obedient to Allah Almighty and to His beloved Prophet. Whoever comes to power in Sri Lanka must take care for you well. Don't worry, the Prophet's word is the best and true one, This news I am conveying to you of the coming days for Muslims,"
"This country, this Ceylon-Serendib is a holy country. So many saints always come and go. The spiritual power must be in this land. 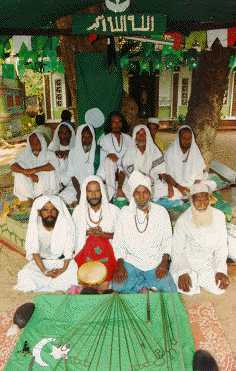 Serendib is like a busy airport, so many saints are always going and coming. You are lucky people." "Allah Almighty turned Adam and Eve out of paradise and sent them to Serendib. He sent His nabis (prophets) to Serendib to guide you. Now soon time is coming for the Beloved One." "That day is coming when East and West will recognize that Allah is God without any second, without any partner. One person's physical body cannot do that, It must be a universal personality. He is the greatest one, coming with a big weapon to take away all the rubbish that is mankind's lack of respect. It is a divine seal from heaven passing through each and every heart. May Allah forgive us for our bad doings towards His prophets." "There are people in this world whose feelings are dead, They are becoming like rocks or robots without any feelings. Dogs are happy and they are glorifying their Lord, You can't find any creature, not even ants, who are not glorifying God. And you, mankind! You are not glorifying your Lord!" "Mahdi is the descendant of the Holy Prophet (Sal) in the fortieth generation. The fortieth. 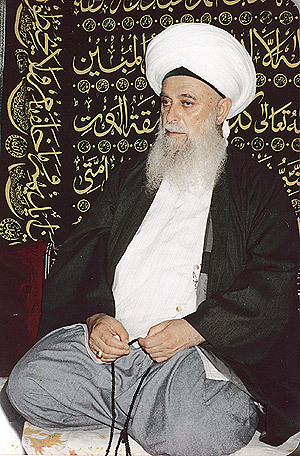 Now he is living, but he is not with people, It is impossible for people to look at him because he has such a heavy power,"
Implying that the current Mideast crisis could erupt into the long-expected Armageddon war, Sheikh Nazim urged all mu'minun (believers) to stay calm and be happy, The unbelievers rushing about at that time, he says, will be blown away by the gale of the Spmt that is coming soon. "Our Holy Prophet (Sal) said, "Oh people, in the days of fitna, if you hear of something happening, stay away from it, And if you are seated, do not get up even to see what is going on there, because he who is seated is in safety. Whoever walks towards fitna to look at what is happening is going to get caught in it. It is dangerous, so please keep away, Oh people." "There are three points. If they are kept, the person cannot be hurt in the wars. First: it is impossible for those who deny the Creator to survive. Second: cruel people will not survive. Third: envious people, the enemies of mankind, will not survive." "It is impossible for believers to be killed during Armageddon or for people with good actions and good intentions to be killed. That is impossible. But those who harm humanity and have enemies and are denying the Creator, they must be killed. That is their punishment." "The highest degree (of islam, 'surrender') is to give up your will to your Lord and to say ‘As You Like!" "On this radar screen they have just appeared. We are expecting it to come down, but it could be in a few years. The General of Staff of the friends of Allah knows. Because one of them is commanding. He comes from the heavens. And we are now waiting for that which will happen. Huge events will come in a very short period of time." "We know that this world is being prepared for huge appearances. In a short while there will be a common change, physically and then spiritually. Time is now over. All nations and all mankind are being prepared for something that is approaching soon. These are huge events, unexpected huge events." "If an announcement is made from the East to the West that a ruby the size of a big ball is to be found in the mountains of Sri Lanka, who would trouble to look for it? There is in fact such a ruby to be found and it shall be brought out when Mahdi Alaihi as-Salam comes. So many things will come out, when Mahdi comes." A novel aspect of Sheikh Nazim's prophetic vision is his prediction that all technology, currently in the service of Shaitan, shall turn back upon itself. The very weapons of Shaitan -- the Devil's own tricks -- will also be his own undoing. "It will not be a secret appearance. He (Mahdi) will appear with power, with so much power that everything will be taken away that technology is supporting and people are trusting in. He is coming with miraculous powers and he will open the seed of faith and make it grow up in the hearts of the people." "Everything, every bomb is under control. None of them will go off without control. Every warhead on every missile as a jinn (genie). They are all under the command of al-Mahdi." "We Muslims do not need to carry pistols or machine guns. There is a need for this for Muslims today because they have no Imam ('pillar' or exemplary leader). There should be one Imam for all believers and for the whole Islamic world, not many kings and presidents like today. "That is the united way that is known through our Shariah (laws) and that is to have one Islamic world and one person to command and the rest must obey. Only this Imam may declare war or fighting." "In the last days so many men will be killed that for one man there will be forty women. This is because men are mostly cruel people. So they will die and the women will survive." "The Grand sheikh used to say that from every seven six will die and one will remain. When Mahdi comes he will bring so many new people with him who will be coming from around this earth. There are so many unknown worlds around from our world." "If you don't like to live in Sri Lanka and if you are not happy with the laws in Sri Lanka, then leave. It is a big and wide dunya (world)." " Anyone who runs away from the Truth (al-Haq) will be punished. They will punish themselves by themselves. Who comes to the truth will be in safety." "Who are the true ones? They are the ones who promised to Allah on the Day of Promises, saying "You are our Lord and we are Your servants, only Your servants." "They were the ones who did not change this promise to become servants of their egos, or servants of dunya, or servants of Shaitan. They are the servants of Almighty Allah only." This article first appeared in The Sunday Times (Colombo, Sri Lanka) of 18 November, 1990.